Ludwig Wilhelm Erhard (German: [ˈluːtvɪç ˈʔeːɐ̯haʁt]; 4 February 1897 – 5 May 1977) was a German politician affiliated with the CDU, and the second Chancellor of the Federal Republic of Germany (West Germany) from 1963 until 1966. He is often famed for leading the West German postwar economic reforms and economic recovery (Wirtschaftswunder, German for "economic miracle") in his role as Minister of Economic Affairs under Chancellor Konrad Adenauer from 1949 to 1963. During that period he promoted the concept of the social market economy (soziale Marktwirtschaft), on which Germany's economic policy in the 21st century continues to be based. In his tenure as Chancellor, however, Erhard lacked support from Adenauer, and failed to win the public's confidence in his handling of a budget deficit and his direction of foreign policy. His popularity waned, and he resigned his chancellorship on 1 December 1966. Ludwig Erhard was born in Fürth in the Kingdom of Bavaria on 4 February 1897. His father was Wilhelm Erhard (b. 1859), a Catholic middle class clothing store proprietor, while his mother Augusta was a Protestant. Ludwig had two brothers and a sister, Rose, all of whom were raised as Protestants. Ludwig suffered from infantile paralysis in his third year, resulting in a deformed right foot and forcing him to wear orthopedic shoes for the remainder of his life. Erhard entered primary school in Fürth at the age of six in 1903 and performed poorly. In 1907, he entered Fürth’s Royal Bavarian Vocational High School, where his grades were average. He received his secondary school certificate in 1913. He was a commercial apprentice at the Georg Eisenbach textile company in Nuremberg from 1913 to 1916. After his apprenticeship he worked as a retail salesman in his father's draper's shop. In 1916, during World War I, Erhard volunteered for the German military. He was referred to the 22nd Royal Bavarian Artillery Regiment and trained as a gun aimer. He first served in the quiet Vosges sector on the Western Front. The regiment was then deployed to Romania on the Eastern Front, where he also saw little combat. Erhard contracted typhus and was sent back to Germany. He recovered and returned to his unit. He was badly wounded on his left shoulder, side and leg by an Allied artillery shell on 28 September 1918 during the Fifth Battle of Ypres. He was committed to a military hospital in Recklinghausen, where he underwent seven operations until June 1919. His left arm became permanently shorter than his right one. Because of his injury he could no longer work as a draper and started learning economics in late 1919 at a business college in Nuremberg. He passed the school's exit examination on 22 March 1922 and received a degree in business administration. During his time at school, he developed a friendship with the economist and professor Wilhelm Rieger, to whom Erhard owed much of his liberal convictions. Thanks to Rieger's intervention, Erhard was able to enroll at the University of Frankfurt in fall of 1922. He received his Ph.D. from the university on 12 December 1925, for a dissertation finished in the summer of 1924 under Franz Oppenheimer. Oppenheimer's liberal socialist ideology had a heavy influence on Erhard, especially Oppenheimer's opposition to monopolies. During his time in Frankfurt he married Luise Schuster (1893–1975), a fellow economist, on 11 December 1923. They had known each other since childhood. After his graduation they moved to Fürth and he became an executive in his father's company in 1925. Erhard spent the next three years as a mostly unemployed academic. His father retired in 1928. The same year, thanks to the help of Rieger and Oppenheimer, Erhard became a part-time research assistant at the Institut für Wirtschaftsbeobachtung der deutschen Fertigware (Economic Observation of the German Finished Goods Industry), a marketing research institute founded by Wilhelm Rudolf Mann and de:Wilhelm Vershofen. Later, he became deputy director of the institute. During World War II he worked on concepts for a postwar peace; however, officially such studies were forbidden by the Nazis, who had declared 'total war'. As a result Erhard lost his job in 1942, but continued to work on the subject by order of the Reichsgruppe Industrie. He wrote War Finances and Debt Consolidation (orig: Kriegsfinanzierung und Schuldenkonsolidierung) in 1944; in this study he assumed that Germany had already lost the war. He sent his thoughts to Carl Friedrich Goerdeler, a central figure in the German resistance to Nazism, who recommended Erhard to his comrades. 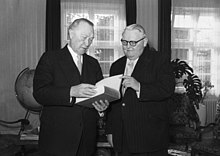 Erhard also discussed his concept with Otto Ohlendorf, deputy secretary of state in the Reichsministerium für Wirtschaft. Ohlendorf himself spoke out for "active and courageous entrepreneurship (aktives und wagemutiges Unternehmertum)", which was intended to replace bureaucratic state planning of the economy after the war. Erhard was an outsider who completely rejected Nazism, supported resistance, and endorsed efforts to produce an economic revival during the postwar period. After the war Erhard became an economic consultant. Under the Bizone established by the American and British administration in 1947, he led the Sonderstelle Geld und Kredit ("Special Office for Money and Credit"), an expert commission preparing the currency reform in Germany's western zones of occupation. The commission began its deliberations in October 1947, and the following April produced the so-called Homburg plan, elements of which were adopted by the Allies in the currency reform that set the stage for the recovery of the economy. In the first free elections following the Nazi era, Erhard stood for election in a Baden-Württemberg district and was elected. He was appointed Minister for Economic Affairs, a position he would hold for the next 14 years; from 1957 to 1963 he was also the second Vice-Chancellor of Germany. A staunch believer in economic liberalism, Erhard joined the Mont Pelerin Society in 1950, and used this influential body of liberal economic and political thinkers to test his ideas for the reorganization of the West German economy. Some of the society's members were members of the Allied High Commission and Erhard was able to make his case directly to them. The Mont Pélerin Society welcomed Erhard because this gave its members a welcome opportunity to have their ideas tested in real life. Late in the 1950s, Erhard's ministry became involved in the struggle within the society between the European and the Anglo-American factions, and sided with the former. Erhard viewed the market itself as social and supported only a minimum of welfare legislation. However, Erhard suffered a series of decisive defeats in his effort to create a free, competitive economy in 1957; he had to compromise on such key issues as the anti-cartel legislation. Thereafter, the West German economy evolved into a conventional welfare state from the basis that had been already laid in the 1880s by Bismarck. According to Alfred Mierzejewski the generally accepted view is that Germany has a social market economy, that the post-war German economy has evolved since 1948, but the fundamental characteristics of that economic system have not changed, while in his opinion the social market economy had begun to fade in 1957, disappearing entirely by the late 1960s. In July 1948, a group of southwest German businessmen attacked the restrictive credit policy of Erhard as Economic Director. While Erhard had designed this policy to assure currency stability and stimulate the economy via consumption, business feared the scarcity of investment capital would retard economic recovery. Erhard was also deeply critical of a bureaucratic-institutional integration of Europe on the model of the European Coal and Steel Community. Domestically, a number of progressive reforms were carried out during Erhard's time as chancellor. In the field of social security, Housing Benefit was introduced in 1965, while federally funded child allowances for two or more children were introduced a year earlier. Erhard considered using money to bring about the reunification of Germany. Despite Washington's reluctance, Erhard envisaged offering Nikita Khrushchev, the leader in Moscow, massive economic aid in exchange for more political liberty in East Germany and eventually for reunification. Erhard believed that if West Germany were to offer a "loan" worth $25 billion US to the Soviet Union (which Erhard did not expect to be repaid), then the Soviet Union would permit German reunification. The acting American Secretary of State George Wildman Ball described Erhard's plan to essentially buy East Germany from the Soviet Union as "half-baked and unrealistic." Erhard's objective coincided with Khrushchev rethinking his relations with West Germany. The Soviet leader secretly encouraged Erhard to present a realistic proposal for a modus vivendi and officially accepted the Chancellor's invitation to visit Bonn. However, Khrushchev fell from power in October 1964, and nothing developed. Perhaps more importantly, the Soviet Union had received a vast series of loans from the international money markets by late 1964, and no longer felt the need for Erhard's money. Erhard's fall suggested that progress on German unification required a broader approach and a more active foreign policy. Chancellor Willy Brandt in the late 1960s abandoned the Hallstein Doctrine of previous chancellors and employed a new Ostpolitik, seeking improved relations with the Soviet Union and Eastern Europe and thereby laying the groundwork for détente and coexistence between East and West. In the 1980s Chancellor Helmut Kohl, however, reverted to Erhard's approach in collaborating with the Reagan administration in its hard-line anti-Soviet policy. ^ "The Social Market Economy." Federal Ministry for Economic Affairs and Energy, Federal Republic of Germany. Retrieved 2015-09-11. ^ Mierzejewski 2004, p. 2. ^ Mierzejewski 2004, pp. 2–3. ^ a b Mierzejewski 2004, p. 3. ^ a b c d e f g h i j Mierzejewski 2004, p. 4. ^ a b c Mierzejewski 2004, p. 5. ^ a b Mierzejewski 2004, p. 7. ^ a b c d Mierzejewski 2004, p. 8. ^ a b c d Mierzejewski 2004, p. 10. ^ Mierzejewski 2004, pp. 8–9. ^ Jonathan, Wiesen, S. (2011). Creating the Nazi marketplace: commerce and consumption in the Third Reich. Cambridge: Cambridge University Press. ISBN 0521746361. OCLC 659413098. ^ Mierzejewski 2004, pp. 18–26. ^ Mierzejewski, Alfred C. (2004), "1957: Ludwig Erhard's Annus Terribilis", Essays in Economic and Business History, 22: 17–27, ISSN 0896-226X . ^ Van Hook, James C. (2004), Rebuilding Germany: The Creation of the Social Market Economy, 1945–1957, New York: Cambridge University Press, ISBN 0-521-83362-0 . ^ Jan Friedmann and Axel Frohn (October 4, 2011). "A 'Half-Baked' Deal Former German Chancellor Considered Buying East Germany". Spiegel. Retrieved 2011-10-05. ^ Schoenborn, Benedikt (2008), "Bargaining with the Bear: Chancellor Erhard's Bid to Buy German Reunification, 1963–64", Cold War History, 8 (1): 23–53, doi:10.1080/14682740701791318 . ^ Matthew D. Tippens, "When Bratwurst Met BBQ: West German Chancellors in LBJ's Hill Country," West Texas Historical Association, annual meeting in Fort Worth, Texas, February 26, 2010; the paper was actually presented by Rob Weiner of Texas Tech University in Tippens' absence. ^ Blang, Eugenie M. (2004), "A Reappraisal of Germany's Vietnam Policy, 1963–1966: Ludwig Erhard's Response to America's War in Vietnam", German Studies Review, 27 (2): 341–360, doi:10.2307/1433086, JSTOR 1433086 . Mierzejewski, Alfred C. (2004). Ludwig Erhard: A Biography. Chapel Hill, London: University of North Carolina Press. ISBN 0-8078-2863-7. Van Hook, James (2004). "Ludwig Erhard, the CDU, and the Free Market". Rebuilding Germany: The Creation of the Social Market Economy, 1945–1957. New York: Cambridge University Press. pp. 139–188. ISBN 0-521-83362-0.